Elvis Costello's Soul Album Gets Double 45 Treatment! While American soul music— northern urban and southern rural—and UK-via-the-Caribbean-derived Ska course through the veins of the fourth Elvis Costello and the Attractions album, the flesh thankfully remains white limey. The album may be a one off diversion from the band's natural creative path but it doesn't go off the cliff. The drum-centric arrangements are relatively spare and to the rhythmic point. Guitars accent but don't dominate the landscape. If you don't listen carefully to "High Fidelity" you might not even notice its Detroit roots. Even the cover of Sam and Dave's "I Can't Stand Up For Falling Down" doesn't outwardly sound like something emanating from Stax/Volt. If you don't pay attention to Elvis's superb overdubbed background singing on the frantic "Love For Tender" you might not recognize the classic soul gestures. Most obvious are the Ska rhythms and echoey guitar production of "B Movie" and "Human Touch" and the Nashville melodrama in "Motel Matches." Once you latch on to what's going on though, the antecedents of just about every track come sharply into focus but like the vocals, they remain back in the mix. The album's hard nosed intensity is unlike any of Costello's previous efforts. The worldly political commentary on Armed Forces and on earlier albums is gone, replaced by more personal matters that don't tolerate irony in either the writing or especially the singing. Elvis sings with an unrelenting ferocity rarely heard from him before or since. When he goes falsetto at the end of "Beaten to the Punch" he expresses exasperation anger and hurt. He rarely lingers on a lengthy vibrato note. The song line-up is intense, ranging from affirmations like "Clowntime is Over" to the usual male/female struggles "Possession," "Man Called Uncle" and "Riot Act." One of my favorites is "King Horse," a song about the lousy job of being a waitress. There are twenty songs here but even more gems from these sessions had to be cut. Songs like "Girls Talk" (excellently covered by Dave Edmunds), "Getting Mighty Crowded" and the uncharacteristically weep "Losing You," among others. It was an astonishing burst of creative energy on all sides, including Nick Lowe's production. However, you really need to read the fine print on this one, written by Lowe just below the track listing for the original's side two. He's goofing on you and he knows it. Lowe writes that he and Elvis "...talked long and hard" about the wisdom of cramming ten loud rock songs onto each side of a single record. We all know what happens when you do that. Levels have to drop, bass gets rolled off, and often the results, already compromised, need to be dynamically compressed. 'We are proud that we can reassure hi-fi enthusiasts and/or people who never bought a record before 1967 that with the inclusion of this extra music time that they would find no loss of sound quality due to groove cramming as the record nears the end of each face. 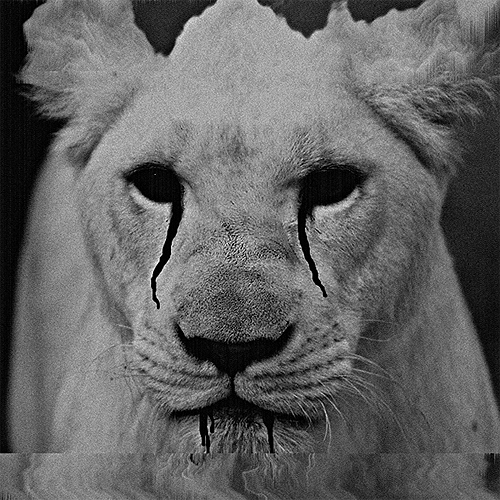 Now get happy." There's a loss of sound quality due to groove cramming on every record to some degree, particularly when you approach the smaller groove radii near the center. Highs roll off. Despite what Nick Lowe wrote, I knew the record was sonically seriously compromised because I got to hear the very, very, very limited edition double 45rpm white jacket promo edition that went out to a few radio stations and members of Costello's entourage. Back in 1980 when this was released, I was living in Los Angeles. An acquaintance of mine worked as a tour stage manager for various bands and he got a copy and played it for me. Going back to the single LP edition, American, British and Japanese was like looking through the wrong end of a telescope. Compared to that magical double 45 the single 33 1/3 sounds small and constricted. You can hear a great , spacious and audacious recording looking for and not getting the breathing room it deserved. I lusted for that promo record. I never forgot it. I lost contact with my L.A. friend but not with that record! 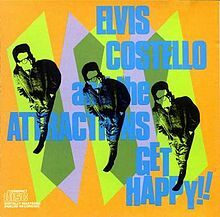 So when Mobile Fidelity announced its Elvis Costello reissue series I told them they had to issue Get Happy!! as a double 45rpm set. They hadn't heard about that promo and they like to reference their work against an original. So what to do? I got ahold of my old friend in Los Angeles and he still had the record! Would he be willing to lend it to Mobile Fidelity? Yes! In addition, when the album originally came out in the U.K. the cover artist had playfully painted on the front and back covers "the dreaded ringwear." It's obviously fake, but the clowns at Columbia Records in America worried that consumers would return the record because of the "ring wear." How stupid! I suggested using the original artwork but I had to prove to Mo-Fi that the original cover had painted "ring wear." So, when this double 45 finally arrived I could not wait to hear for the first time in thirty one years Get Happy!! unleashed! Was it worth the effort, the time and the expense to produce this as a double 45? If you've grown up on the original you will be astonished by the width and depth of the picture, by the dynamic thrust, by the cleanly separated instruments, by the weight of the bass, the shimmer of the cymbals and the way the effects Lowe inserts puncture the air. You'll also be able to hear Costello's robust lead singing and his carefully rendered background vocals with greater spatial and textural clarity than you've ever heard them. If you've never heard this album you'll just find it overwhelmingly fantastic in every way. If it doesn't get your body moving, you are paralyzed. And if you think the CD edition you bought eliminated all of the cramming issues, well, you're in for a big surprise. Mobile Fidelity got everything off the tape and into the grooves in ways the digital edition simply does not. So no, this is not inexpensive for a pop record, but it's among Elvis's finest in every way and finally, thirty plus years later we finally get to hear what Elvis, Nick and the others heard in the studio. Will Get Happy!! make you happy? Count on it. Most highly recommended! Sacramento’s independent music store, The Beat!, is a real gem when it comes to buying great music. The large, one-story location, on the corner of J and 17th , is stocked with videos, cassettes, vinyl, and cds and dvds. The Beat! has six sections for jazz music including new and used vinyl, rare jazz vinyl, new and used cd's, and a jazz cassette section. The shop has been at its current location for the past eighteen years. When it started in 1982, the store was located around the corner from Sacramento State. Next year, The Beat! will be celebrating its thirtieth year on the scene. The owner, Robert Fauble, his brother Brad, and a staff of 12-13 people keep the store up and running. Mr. Fauble sat down to talk about selling music, the decline of record labels, and some beat history. Is the record store making a comeback? Is there a new beginning for record stores after vinyl sales surge? The UK, as everyone knows, is in the grip of a digital music revolution. Physical media appears to be in its death throes, being rapidly replaced by digital downloads. Indeed, digital files accounted for 99% of the UK singles market in 2010, and it seems that albums are heading the same way. Meanwhile CD sales are plummeting, having fallen by 12.5% in 2009 alone. To many, this spells the inevitable demise of the record store, once the mainstay of the teenager’s Saturday trip into town – and one of Britain’s best-loved small businesses. This would appear to be illustrated in the struggles of high street giant HMV, which announced the closure of a further 60 stores in January. HMV is increasingly turning to DVD and game sales to try and rescue the brand, with CDs taking up a dwindling amount of real estate on the shelves. But against this bleak backdrop is the glimmer of a resurgence in the record shop industry, driven by the unlikeliest of formats – the vinyl LP. Peter Gabriel has finally run out of new ideas. What other reasonable conclusion is there to be made given all his recent activities? His current album consists of all cover songs. He's doing shows with a symphony orchestra. And he'll soon release a 25th-anniversary special-edition version of one of his most cherished records ("So"). Those are all gimmicks used by over-the-hill artists on the hunt for one more payday. It's not what we expect from Gabriel, a man rightfully championed for his ability to stretch the boundaries of pop music. I guess even a rock 'n' roll visionary needs to step back and rest on his laurels occasionally. And Gabriel is doing it in way that many of his fans should find quite enjoyable -- with a symphonic tour in support of 2010's all-covers work, "Scratch My Back." The one thing that we learned on opening night of this North American tour -- Friday at UC Berkeley's Greek Theatre -- was that Gabriel has great taste in music. Rock & Roll Hall of Famer Bernie Worrell has announced the release of a new digital and limited vinyl album of jazz standards on June 7, 2011 on Scufflin' Records. The album, titled 'Bernie Worrell: Standards', features Worrell alongside an all star line up of renowned musicians including Smokey Hormel on guitar, Melvin Gibbs on bass, JT Lewis on drums and Darryl Dixon on saxophone in addition to others. This is the eighth solo album for Worrell, who was a founding member and musical director of original Parliament-Funkadelic (P-Funk) and has collaborated extensively with Talking Heads. Gary Scotti operates a record store. His gift is an inventive method to attract customers. Great idea, I hope it makes him a ton of money! Gary Scotti is giving away vintage vinyl LP’s, new and used, on South Street and also at his Summit store. No purchase necessary. Void where prohibited. “Play it, poster it, or re-use it,” he says. Vinyl continues as an integral part of the music business. Founded in 1956 Scotti’s Record Shops are the oldest independent music store in the country. Over fifty years ago Scotti’s Record Shops sold only vinyl records. The current state of recorded music is experiencing a renewed interest in this vintage medium. From classical to rock and jazz up through to pop and modern music. Small independents and major label artists continue to utilize the versatile Long-playing (LP) Record. The Vinyl record is the only format of growth in the recorded music industry. Vinyl continues to surge with double digit increases in unit sales over the last several years. Most newly recorded albums come with a compact disc or digital download included with the vinyl purchase. Saturday June 11th, 2011 is Free Record Day at Scotti’s Records Shops in both Morristown and Summit locations. Participants will receive one free record of their choice for visiting the store on that day. The purpose is to distribute this tangible form of music to as many as possible. The customers in turn may use the LP in whatever manner they see fit. Play it, poster it or re-use it. Dine Alone Records recently signed The Coppertone and they have released a limited edition vinyl for their album, “Hymns For The Hollow“. It is pressed on 550 copies of clear blue and is available now through Dine Alone’s new online store. Hank Williams debuted on the Grand Ole Opry in 1949. The Spaniels debuted at the Apollo Theater in 1954. In 1960, drummer Tommy Moore makes the fateful decision to quit The Beatles and return to his job of driving a forklift at Garston bottle works. He would briefly be replaced by Norman Chapman, who was called into National Service after just three gigs. After going drummerless and mostly jobless for a few weeks, the band would hire Pete Best on August 12th, only one day before they were to go to Hamburg to play a string of club dates. In 1964, the Rolling Stones have a press conference in the middle of Michigan Avenue in Chicago. The police eventually show up to disperse the crowd. The triple album "Woodstock" soundtrack was released on Cotillion Records in 1970. Steely Dan's "Rikki, Don't Lose That Number" was released in 1974. "Play That Funky Music," by Wild Cherry was released in 1976. In 1977, KC and The Sunshine Band scored their fourth US number one hit with "I'm Your Boogie Man", a song that was written about a DJ at a Miami, Florida radio station named Robert W. Walker, who was the first to give their hit single "Get Down Tonight" airplay. Some Girls by the Rolling Stones was released in 1978. In 1988 - The concert celebrating the 70's birthday of Nelson Mandella was held at Wembley Stadium in London. Performing were Whitney Houston, Phil Collins, Stevie Wonder, Dire Straits, George Michael, Eric Clapton, Tracy Chapman, UB40, Eurythmics and Simple Minds. In 1995, Jimmy Vaughn, Eric Clapton, B.B. King, Buddy Guy and Robert Cray reunited for a tribute to Stevie Ray Vaughn. All five had played with Vaughan at his last show on August 26, 1990, before he was killed in a helicopter crash.